These sensors are unique in their construction. The front end of the sensor is the same as the 19 mm sensor, with the smaller diameter and no crevices or o-rings. 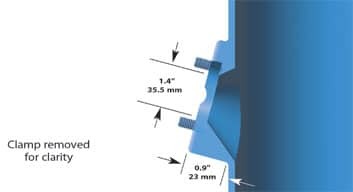 It fits directly into a 1.5” sanitary pipe tee, eliminating the need for a housing, reducing contamination risks. Designed with an integral 1.5” sanitary flange, a gasket seal at the flange holds the sensor securely in place. 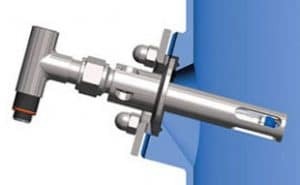 This sensor is also available with right-angled connector as D215. 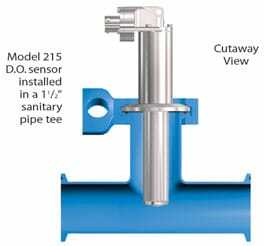 The Models D210 Series Dissolved Oxygen OxyProbe sensors are intended for use in a 1 1/2” sanitary pipe tee. 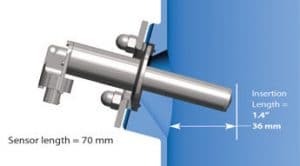 The sensor is secured into the tee with a standard flange clamp sealed with a flange gasket. The tip of the sensor is positioned in the middle of the process flow when it is placed in a standard size tee. These sensors can also be used in NovAseptic ports.